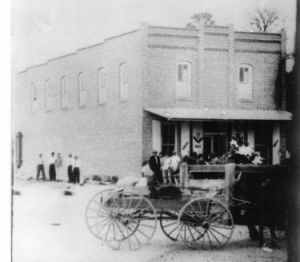 The one structure that defines Burke was the old brick Post Office building, which was also home to the Burke and McCall Store. For many years the building housed a store operated by Lee Burke and Daniel McCall. Mr.Burke ran the store, and Mr. McCall ran the post office, which was located in the front corner of the building. Eventually Daniel McCall was succeeded as postmaster by his daughter Ina. By one report the store was owned by H. P. Riley before Burke and McCall, and a Falvey was killed by Artie Crager in the store. The 1910 census shows and Henry T. Riley as a merchant in a general store. By the late 1950s the store was pretty much defunct with only a few sacks of feed left to sell. The shelves on the walls and the glass display cases were all empty. An old balance beam scale sat in the middle of the floor with nothing to weigh. The only active part of the building was the Post Office in the front corner of the building. Miss Ina worked behind a big, dark colored counter with a bank of mail boxes beside it. The boxes had a combination lock with a center knob with a little pointer to letters around the edge. Beside the door was a board with a sheaf of wanted posters bearing photos of scary looking people who were on the run. The building was sold by the Masons in the 1970s, and the brick was used to build the home of Dr. Barrett on Daniel McCall Drive (Old Texas 35) south of Lufkin.